One of the SYP panels I attended at the 2019 London Book Fair. In past seven months on the Edinburgh Napier Publishing MSc, I’ve learned so much: skills in design and editorial, personal and professional development, developing a more comprehensive understanding of the publishing industry, as well as taking advantage of placement opportunities here in Edinburgh. However, the decision that has had the most significant impact on all of those elements was becoming a member of the Scotland chapter of the Society of Young Publishers (SYP) back in September. While I may not have attended many casual mixers (social anxiety and general fatigue don’t usually put me in the party mood), I have gone out to workshops, events, and the annual conference in February 2019. At each and every one I learned so much. As you can imagine, for these reasons alone I would recommend joining the SYP, and if you are looking to get into publishing, I would suggest seeing if there is an SYP group in your area. In our current times of political and social uncertainty, SYP’s focus for this years conference was on how we can bridge gaps in the publishing industry and break down barriers that provide obstacles for young publishers starting out. The title of this years SYP Conference hinted at the diverse range of topics that were to be discussed. The day started off early and upon registration we were greeted with the prospect of a tote bag filled with many industry necessities; a copy of The Bookseller and The Skinny along with a few free books – a publisher’s dream. The talks were soon on their way where we were privileged to hear from the keynote speaker Marion Sinclair, talking about her time in the industry and how it has changed over the years. Then it was onto our first panel Elsewhere, Home: Scotland Meets the World where there was interesting discussion on the international approach that can be applied to publishing. Scottish publishing appears to have an international appeal where certain books have the power to travel across the continent and beyond. Scotland’s vibrant culture fuels international interest of Scottish novels where publishers can latch onto the attraction to our rich culture and promote Scottish writing worldwide. After a short coffee break to mull over the benefits of international publishing and also the challenges – such as visas being rejected and the high financial cost to go worldwide – we had a decision to make. The conference offered us our first choice of panels between How to be Both: Transcending Genre or The Trick is to Keep Breathing: Managing your Time. If only we could be in two places at once. As I’m a bit of a lost cause in terms of time management (and as How to be Both references a novel by one of my favourite authors Ali Smith) I decided to go with the former – and I wasn’t disappointed. The panellists engaged in discussion about what genre means to them, how it both helps booksellers yet can also be restrictive for publishers. Francais Bickmore was right in saying that genre is a ‘necessary evil’ in that it simplifies book categories yet can inhibit the reach and appeal of that book. It seems the way genre is used and recognised is constantly changing. As Ann Landmann suggested ‘genres are like trends, they will come round again, eventually.’ We can’t escape genre but maybe we can use it in new and innovative ways to make people more interested in different books and to celebrate the kinds of reading we do enjoy. Next up was The Driver’s Seat: Sales Representation in Scotland which asked the question ‘What makes the ecosystem of Scottish publishing tick?’ It was interesting to have different perspectives of the bookselling process from both a publisher and bookseller’s point of view. The art of bookselling continually changes with the rise in social media altering how we as consumers are attracted to different books and different mediums of reading. We were then treated to an inside look into what owning your own publishing company is actually like. Heather McDaid and Laura Jones from 404 Ink and Samuel McDowell from Charco Press joined us and gave honest insights into the trials and tribulations of owning your own business. They didn’t make it sound easy but it was refres hing to hear individuals willing to share their low points and it made me even more excited in seeing what projects and ambitions these publishers will follow next. To round off our panels for the day we heard what industry experts thought about diversity in publishing. Wish I Was Here: Inclusivity in Children’s Publishing raised some important questions as to what is being done in the industry to ensure publishing is more representative of its readers. Whilst the results of the diversity reports don’t paint the industry in a good light, it is encouraging to see that some publishers are challenging the ways in which they hire staff and commission work. As bleak as diversity in publishing can look, the panel had an optimistic approach that it can be improved if all aspects of the industry can work together. To finish off our day we had an inspiring closing keynote from Perminder Mann of Bonnier Books UK sharing her experience of how she got into the publishing industry. In telling her story, it is evident the amount of drive and passion she has put into her work and it is clearly paid off. One of her top tips was to ‘always remember you have the right to be there’, a statement I’m sure many of us will take away and hold on to. It may be February now, and this blog post might be coming a little bit late but if you can, cast your mind back to last November. It’s cold and blustery on the Royal Mile but down a wee alcove lies Canongate Books, a safe haven waiting to welcome you in. Thanks to the generosity of SYP Scotland as well as Canongate themselves, a few of us lucky individuals were able to go along to a Marketing and Advertising Workshop run by Vicki Watson, Head of Marketing. Jamie Norman, Co-Chair of SYP Scotland and Campaigns Executive for Canongate, was also sitting in, and welcomed us to the workshop at the beginning. Vicki began by defining copywriting, exploring the different kinds required when targeting different audiences. She talked about the importance of tailoring what is written and how it is written to the product, the audience and the company. We were then asked to evaluate blurbs and talk about why they worked or didn’t. Our own attempts at writing a blurb for a book of our choice were read out and discussed by the group. Luckily, it was a really supportive atmosphere filled with people who were not reluctant to speak up but also listened to the contributions of those around them. Vicki talked about her time at VINTAGE in London before coming to Edinburgh and working for Canongate, and talked us through billboards, tube posters and other marketing campaigns she produced. The choices that shaped and connected the campaigns for Matt Haig’s Reasons to Stay Alive and Notes on a Nervous Planet were explained in detail. The evolution of Robert Webb’s How Not to Be a Boy was used as a case study example of when marketing changes between hardback and paperback editions, with the cover, blurb and campaign being tailored to the new way of selling the book. When the workshop finished, I left feeling a lot more clear on what copywriting entails and how to make sure every word counts, as well as gaining a more general insight into marketing books successfully and creatively. It was such a helpful and informative evening in a lovely building with supportive people. I wanted to say (a very belated!) thank you to Vicki, Jamie, SYP Scotland and Canongate Books for the opportunity! Before deciding to study publishing, speaking to people came naturally. I could approach a stranger at an event easily and spark a conversation because there was no ulterior motive for doing so, other than the sheer enjoyment of human interaction. Now, however, I do have an agenda: I want to be noticed. I want to be remembered. I want to make an impression so that someone, somewhere will one day think I’ll be an asset to their company. When I began Napier’s course, I was encouraged to attend as many events as possible and to grab every opportunity by the horns. This had never been an issue for me before because I either decided to go to an event or I decided to stay at home. If I wasn’t feeling up to it, or had a rare day of feeling shy, I felt no guilt in curling up in my jammies and spending the evening binge watching Netflix instead. But now, I can’t afford to stay at home and miss out on meeting all the important people. The guilt is real. I know that if I don’t go, I’m only disadvantaging myself and my future career. That being said, whilst I do want to emphasise the importance of getting out there and interacting with people in the industry, because hey, they’re bloomin’ incredible folk, I have discovered an absolute saviour in the networking business: Twitter. Twitter is definitely something I stayed away from pre-publishing degree. I didn’t understand how to use it properly, and again, I had no real agenda. Connecting with friends was far easier via other social media platforms, such as Facebook and Snapchat. But upon venturing into the publishing industry, Twitter has become my holy grail for when I need to network but am not particularly feeling up to it. I cannot stress the value of this incredibly, sometimes dauntingly, fast-paced-updated-by-the-second environment. There is no better way to stay in the loop and up-to-date with the publishing industry. I can refresh my feed every minute and someone will have a new opinion, there will be a new article to read or a new connection suggested. Even better, I can do it all in my pyjamas with Netflix on in the background. One of the many major benefits of Twitter is the ability to participate in live conversations. The SYP are extremely well versed in this, and often host live chat Q&A evenings. These typically last an hour and allow people from all over the world to engage with people in the industry. You can voice your fears and receive comfort, share your experiences, teach others valuable lessons and learn anything and everything in the space of an hour. Above all, you can make those all-important connections, whilst simultaneously cooking dinner. Various events I’ve attended have shown me that having a strong Twitter identity really pays off when meeting people face to face. If you’re active in the community and your profile is recognisable and memorable, then chances are someone will remember that conversation they had with you, where you helped them overcome a fear, or gave them advice they later followed. Finally, I suggest really getting to know how Twitter works. Use ALL the hashtags, even base your tweets around being able to hashtag as much as possible and include the publisher in your tweets when talking about a book. Show that you have an interest in the industry and that you appreciate someone’s work. The engagement these tweets can generate is unreal and allows people in the industry to see that you’re an active member of their community. If you’re new to Twitter like I was, build an identity that you’d be happy to show a potential employer. Be someone that your mum would be proud of and that someone in the industry would want to meet. It’s also great when someone’s accusing you of not being productive because you’re on your phone, (I’m looking at you, boyfriend) and you can tell them they’re wrong: you’re networking. On 26th October 2017, The Society of Young Publishers Scotland and The University of Edinburgh’s publishing society, PublishEd, held an evening with six speakers from six publishing companies. The aim of the evening was to provide a six-minute insight into each speaker’s role within the publishing industry. 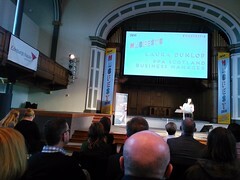 The first speaker was Rosie Howie from educational publisher, Bright Red. Rosie explained her role as an editor throughout the processes of book production. Her useful tips were to do structural editing first in terms of formatting and style before the first draft of the final typescript is ready for a detailed copyedit. She stressed the importance of peer reviewing the author’s work, particularly in educational publishing, and in working through changes with the author to get the best results for an educational book. The next stage is where copyediting takes place before being sent to production for typesetting. Another tip I learned was that up to five proofreads of the manuscript should be carried out before signing it off as error-free and sending it to production – signing your name against poorly proofread copies is not good for your reputation as an editor! It was extremely helpful to hear the daily tasks and challenges of the editor and the importance of their overarching role within a publishing house. The second speaker was Laura Jones, a production freelancer and one half of The List 100′s number one publisher, 404 Ink. Laura opened up the idea of production as a possible career option which before now, no one had really explained to me. She described her role in producing and designing the books for 404 Ink and the benefits – and challenges – of working as a freelancer. It was very insightful to hear how someone in my position just a few years ago has become so successful in creating her own company, and the enthusiasm she has for her role within the publishing industry was inspiring. 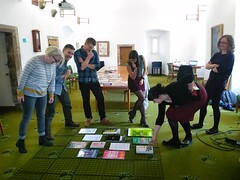 Laura also very helpfully explained that you don’t always have to know what aspect of publishing you want to work in from the outset and that this can often be determined from trialling different areas within a smaller publishing house to discover your strengths, which was very encouraging. 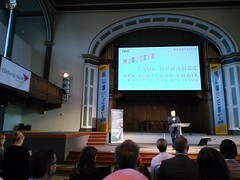 Jamie Norman, campaigns assistant for Canongate, was the third speaker of the evening. Jamie discussed the importance of pitching to the marketing and publicity of a book and of having a strong hook to your pitch to really capture and hold your buyer’s attention. A useful tip I learned from Jamie was how to tailor emails to the outlet or brand that you are trying to reach and to keep email pitches succinct, leading with the most relevant information for maximum effect. Jamie discussed some of his best tried and tested marketing techniques; competitions with unique prizes saved for publication week, extensive social media campaigns for top titles, and physical advertisements which, although expensive, can be invaluable with the right design. Most importantly, I learned how crucial it is to be prolific in your marketing. Speaker number four was Vikki Reilly from the sales team in Birlinn. Vikki really opened up the option of sales to me as a career choice in a way no one had really done before. Her passion for sales and bookshops was infectious. She described her role as being at the centre of everything, liaising with people of all departments because she was in the position of having the most market knowledge through working with book buyers on a daily basis – and spending most of her time in bookshops. She also explained her responsibilities in organising and running promotional events, traveling, and working with non-traditional outlets like whisky shops. The variety in this role was really appealing to me and was something I had never really considered before but will definitely think about now. Another top tip from Vikki; just try new things and don’t be afraid to make a fool of yourself! The fifth speaker of the night was Janne Moller who has the very interesting job of travelling the world and selling rights for Black and White Publishing. Her key role is in selling translation, audio, and large print rights which means she has to know as many commissioning editors and publisher’s lists as possible to know who to sell to. She has the exciting role of travelling to major book fairs around the world and liaising with new people from all countries. She also described the challenging aspects of her job such as back-to-back meetings with literary agents and commissioning editors. One thing I learned from Janne was about the use of literary agents who are a type of sub-agent some publishers may utilise to sell their books in other territories much more easily. Another was literary scouts who know their clients (publishers) very well and can pick out books they would want to publish to save publishers time. It was interesting to find out about these sub-roles in publishing which I had never been introduced to before, as well as the extensive role rights managers have to play within a publishing company. Lastly, Mairi Oliver took the opportunity to discuss the issues of diversity within bookselling. Mairi works for the radical and diverse bookshop, Lighthouse Books in Edinburgh. She discussed the importance of her role as a bridge between the publisher and customer and the need to know your books and customers really well to get the right books to the people who’ll love them most. As a diverse bookseller, she expanded on the necessity for publishers to rethink their lists in order for minority groups to be given a larger platform within the book industry for their voices to be heard. She spoke about the need for publishers to include more women in their lists and argued for more female writers to be put forward for literary awards. It was genuinely uplifting to hear someone so passionate and dedicated about these necessary changes within the industry promoting them to fellow publishers and publishing students who are in the privileged position to make them. Overall, the evening was completely inspiring for me, a new publishing student, in broadening my understanding of the different roles within the industry from a bunch of excited, enthusiastic, and extremely friendly people and instilled in me that same enthusiasm for a future career alongside them in the publishing industry. I’ll definitely be going to more events hosted by PublishEd and the SYP! Advice on your new publishing world! I applied for MSc Publishing at Edinburgh Napier University pretty late on last year. I had graduated with an Honours in English Literature and was a bit stuck on what to do. This course was suggested to me by a careers advisor. I applied after doing a bit of my own research, and was accepted to the course to start in September 2016. Initially, it was daunting, as any would any masters course would be, and in the run up to my start date I began looking online for some more information about what I would be doing. Author clairehalavagePosted on 07/05/2017 27/08/2017 Categories Events, Merchiston Publishing, publishing studiesTags Learning, London Book Fair, Scottish Poetry Library, student, SYP Scotland, TwitterLeave a comment on Advice on your new publishing world! 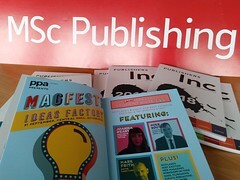 On Tuesday 24 February 2015 some of the MSc Publishing students had the chance to attend the annual Publishing Scotland Conference, held at the COSLA Conference Centre Edinburgh. The day consisted of presentations from various publishing professionals form all areas of the industry, and many tea breaks that gave everyone, not just students, the chance to network. Chaired by Jenny Brown, from Jenny Brown Associates, the day began. The first guest speaker was Charlie Redmayne, CEO at HarperCollins UK. Charlie discussed how he came to be CEO of such a prolific publishing house. What was interesting is that he never studied publishing, like many of the speakers who came after him. His speech was very motivating and insightful, his best gem of information being “publishing is fundamentally about great editors working with great writers.” Something many of us in the room could take comfort in hearing.